Peanut Butter & Jelly Sandwich... Grilled! What is it about grilling a sandwich that makes it something so indulgent? Think about how "blah" a 'cheese' sandwich would be without the 'grilled.' 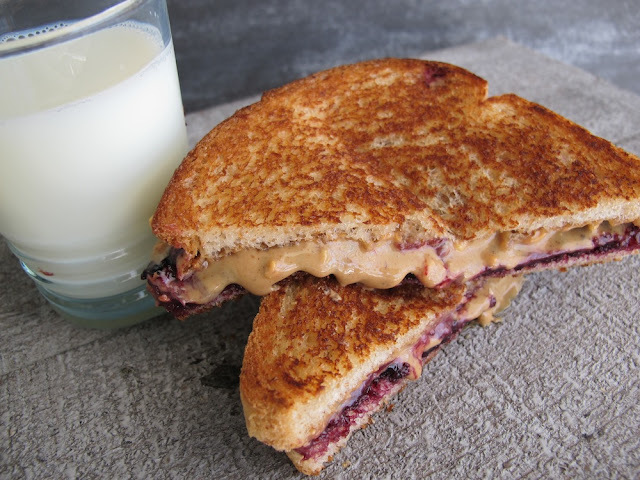 Grilling a peanut butter and jelly sandwich turns it into the most delicious treat... one of my favorites for cold winter mornings like these. Assemble peanut butter and jelly sandwich. Butter the outside of the sandwich. "Grill" the sandwich in a skillet on each side for 2 minutes on medium-high until it has browned. Enjoy the eewwwy and gooey treat! this. looks. delicious. i will be making it asap! that looks delicious! i've never tried pb and j grilled...I definitely will try it now! looks delicious! Love this idea! Trying it soon...maybe with bananas & apple butter! I think this is breakfast tomorrow! This just "ups" the PB&J awesomeness. Great recipe!! Simple, and delicious. Ok...this is brilliant! Breakfast tomorrow solved! My grandpa used to make me grilled PB&J. It's one of my guilty pleasures. Something I've never tried but am wondering why, it makes so much sense. That looks like such a delicious American treat. Would LOVE to introduce this to the French in Paris where I live :) The Parrardelle beef ragu looks incredible as well. Yummmmmm. Ohh, I did this once while camping over the grill. It was incredibly good. now this can be my "grown up version"... as a child, my mother used to toast the bread and add the pb&j. it was my favorite sandwich... and, some days i would ask for a quarter of a sandwich... oh how i wish i could still do that... bring it on! i will eat the whole thing! Melted peanut butter is the best peanut butter! YUM. i love grilled pb & J. sometimes i change it up and do the elvis...pb, honey and bananas, grilled! awesome! Never would have thought of this, it was delicious!